Some children just get so excited about contributing to big special events. Sometimes adding your kids’ school artwork to the Thanksgiving table as a centerpiece makes them so proud to get to share the big day with the turkey. Often, letting them create something specifically meant to compliment the day, the table setting or the meal can be so simple and so special. 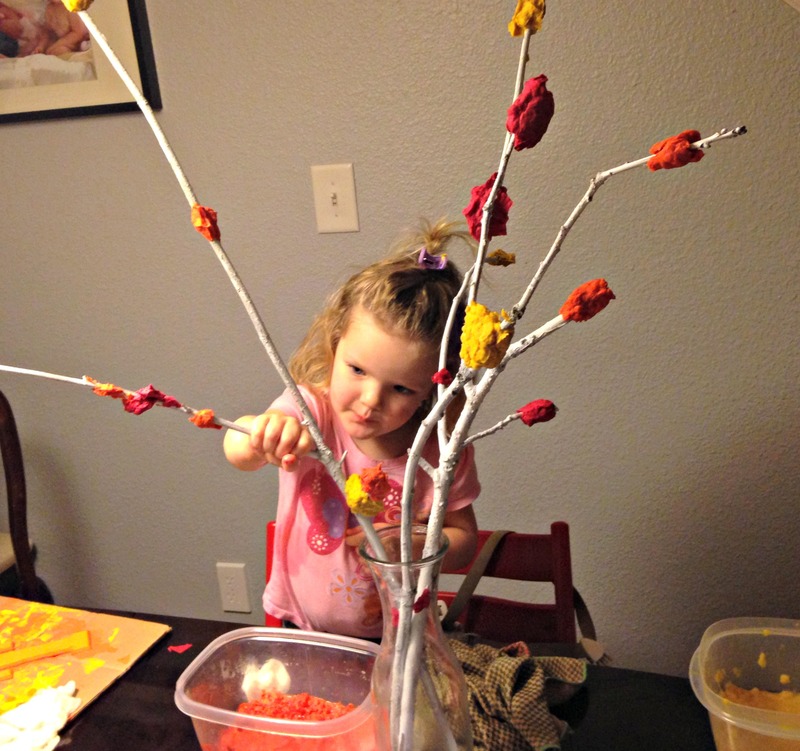 For less than $10, or even for no cost, you can get your kids involved, give them a creative outlet and end up with something pretty special as a table centerpiece. 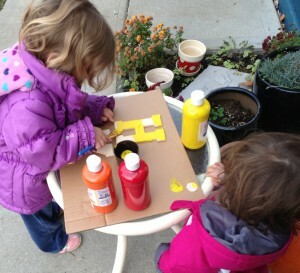 At the craft store, purchase wooden letters to spell “THANKS” and paint them to compliment your table linens. The letters can be arranged on a table down the center or propped on different dishes. They also look nice above the fireplace. If your children have letter blocks, incorporate those into your decor instead and spell out words like “thankful” or “fall”. Head out on a nature walk and find some branches, spray paint them if you wish (adults may need to do this part). Arrange the branches into a vase, weight it down with stones if needed. Have kids trace leaf shapes onto construction paper and cut them out. Make a hole in the leaf and string dental floss or yarn through so that they can be hung like ornaments on the branches. Place one leaf at the place setting for each guest. Ask guests to write and share something they are thankful for and help decorate the tree. You can even collect real leaves and let guests write on them with a permanent market and then add them to your thankful tree. In addition, consider trying your hand at decorating using paper pulp to incorporate the colors you are decorating with. You can learn about making paper pulp from Housing a Forest. Scoop up a handful of the pulp and squeeze excess water and form it around the branches, continuing to squeeze any excess water. Do this until you have the desired affect on your branches. The website we learned from used smaller branches and smaller amounts of pulp. We used larger “gobs” because of the age of our children and their abilities. Combine all of the above ideas or use your favorite to decorate your table for the big day, pretty up your hearth or even use them at the food service table is that is separate from the dining table. Whatever you choose to do with your holiday decorating, include the kids. You’ll love hearing them share with friends and family all about their contribution. Happy Thanksgiving!